If you have ever imagined walking on a footbridge which is hanging high up in the sky and soaking in the exhilarating views of mountains and the sea below, you can actually fulfill that dream in Langkawi. The sky bridge which is part of the master plan of Mount Mat Cincang Geo Park, has been designed and constructed to give you such experience which is otherwise impossible to attain. 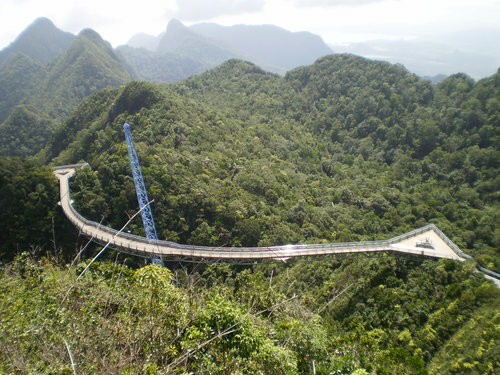 It is a curved suspended bridge made of steel that hangs at an altitude of about 700 meters from the sea level and supported by a single pylon in the middle. The pylon which is a tall tower like structure, has a record breaking height of 82-meters from the point where it is grounded on a ridge and keeps the bridge suspended in an open space next to the peak of Mount Mat Cincang. So where is the skybridge and how can you reach there? The bridge is located at the peak of Mt. Mat Cincang. You will need to take the Cable Car ride from Oriental Village in Pantai Kok area, go up to the top station and then access the bridge through a stairway. That is the only way you can reach the skybridge. From the cable car you get spectacular views of mountains, rain forests, beautiful valleys, the Andaman sea and the islands on it. From the top station, there is an approach way and a long steep flight of stairs leading to the bridge. It's some climb on the way back up and not suitable for those having mobility issues. However most do make it. The stairs and the bridge have been recently repaired and renovated. The curved sky bridge is 125 meters long and 1.8 meters wide. It is considered amongst the longest curved pedestrian bridges in the world. It hangs in the space over virgin mountain forest offering unbelievable views. On a clear day you get views of the Andaman sea and its islands, and even some parts of Thailand. There are two triangular platforms at two ends of the bridge, which are wider and serve as resting and viewing areas for the tourists. The curved shape of the bridge gives a unique feeling as you walk along. It provides different perspectives of the surroundings with every gentle turn you take. The bridge actually connects Mt. Matcincang with a neighboring mountain. The skybridge is quite safe. It has two solid steel railings on two sides as well as steel wire mesh below. So you can not fall off. You must be wondering how such a suspended curved bridge was constructed and installed so high up in the sky. Yes, it is considered one of the engineering marvels in the world. It had to take into account so many factors like balancing from the top of a single pylon, the optimal load and its correct distribution throughout the bridge, pre-fabrication of the bridge and how to install at such difficult high terrain. In fact after fabrication, the entire bridge was lifted by helicopter up to the peak of the mountain and then fitted into the pylon. It was opened to public on 27th February 2005. Skybride is open 10am to 5pm daily. Entry: RM5 for adults and RM3 for child. This is separate from the cable car ride. You can purchase tickets at the ticket counter located at the top station. If it is cloudy around the bridge and the peak of Mt. Mat Cincang, you won't get any views. So see from the base (i.e. Oriental Village) if there is any cloud formation before you buy your tickets. The taxi drivers can help you. There can be a long queue at the cable car ticketing counter as well as at the gondola waiting area. The total waiting time can be well over an hour depending on the time and day of the week. So go early before the counter opens. Update February 2015: Having remained closed since July 10, 2012 due to upgrade and maintenance work, the sky bridge has now re-opened. The main structures have been replaced with steel. There is a new 10-meter long glass made walkway at the middle section so that tourists can get stunning views of the valley and rainforest below. It's located at the north western side of Langkawi in Patai Kok area. You can take a taxi or a rental car to reach the cable car which operates from the Oriental Village. 2) Oriental Village: All other attractions & activities in Oriental Village complex. 4) Pantai Kok Guide: All about Pantai Kok including activities, hotels, restaurants, shopping etc. 5) Langkawi Attractions: All the top tourist attractions in the island.